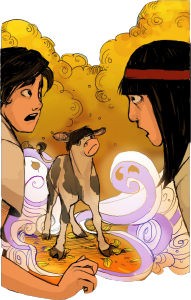 In case you missed it, Paul Jenkin’s Fiction Squad comic book mini-series was a continuation of his Fablewood concept: A place where all fairy tales and bedtime stories live side by side. Now Boom! Studios have collected the entire 6-issue series in a new Fiction Squad trade paperback. “Fablewood is a pretty dangerous place, but no area is more dangerous than the City of Rimes, deep in the heart of the Children’s Realm. After transferring in from the Realm of Mystery, a failed detective from an unfinished prose novel, Frankie Mack, is about to uncover a conspiracy that could unmake storytelling itself. 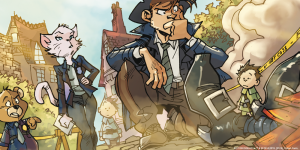 After Humpty Dumpty is pushed to crack and Jack (of Jack and Jill) goes AWOL, Frankie and his partner, Simple Simon, are put on the case.” With full color illustrations by Ramon Bachs, the book is 160 pages and it’s coming very soon. Take a look over at the Boom! web site. Anthropomorphic animals (and many other things!) abound. Is There More to Life Than Killing? Teagan Gavet is likely better known in furry fandom as the artist Black Teagan — and perhaps known best as one-half of the award-winning art collective known as Blotch. 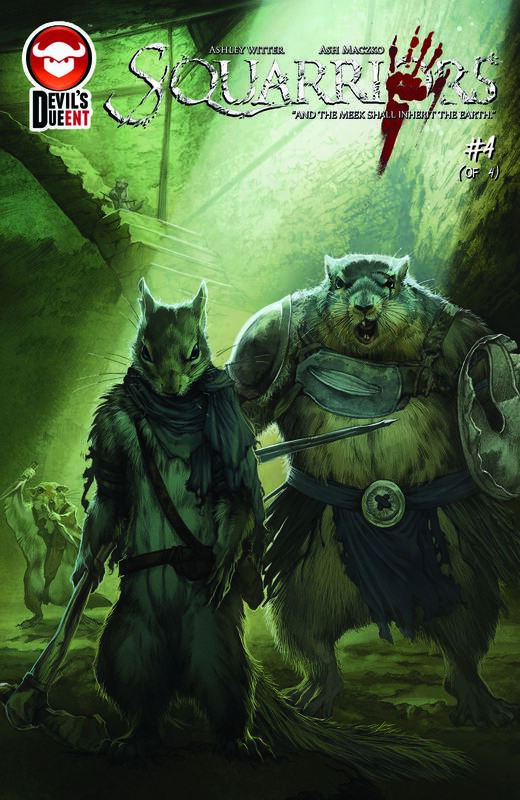 Now she has created a brand new full-color anthropomorphic graphic novel of her own, Oren’s Forge, and she plans to put installments up on line starting soon. “The bizarre rumor of a sanctuary free from predation has reached many animals, and not just those considered as prey. Two pine martens, Rask and Quannaq, follow the tales to the lake that lay in the shadow of mountain. While they have the long teeth of a flesh-eater, they know the constant fear of greater hunters who consider them only meat. Convinced that there is more to this life than a mere transition into death, they go on toward the unknown, unsure if they will find welcome or ruin.” Visit the official web site for updates, and look for Oren’s Forge on line starting November 16th. “What can an ordinary hamster do in a kingdom filled with magical hamsters?” That’s the question poised by the Ivan the Hamster Knight series of illustrated books for young readers, created by Helen Penpen. “Ivan is the only hamster with no magic powers, and he finds himself in a very awkward position. Not able to fit in, Ivan is ordered to leave by the hamster queen. 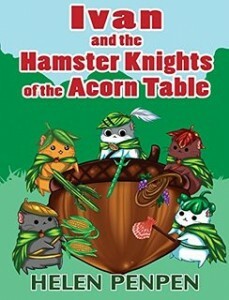 His adventure then begins…” Ivan and its sequel, Ivan and the Hamster Knights of the Acorn Table, are available in hardcover over at Barnes & Noble. “Cosmic Dash is a webcomic with science fiction and space opera influences that updates every Friday. The comic deals with a massive galaxy called the Silver Spiral that is being explored by many different alien races and three principal factions. The comic focuses on Dash Kameku and his crew-mates as they transport cargo around the known galactic territories and beyond.” Got all that? 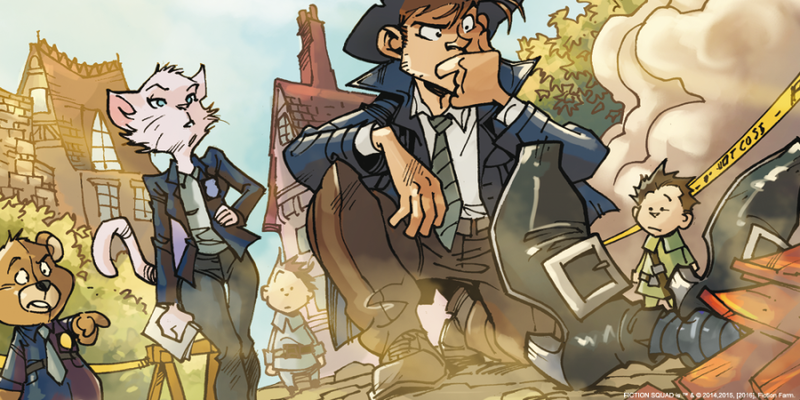 The series is created and illustrated by David A. Davis with the help of Deft Beck (writer) and Tobias Van Den Bergh (inker). The Cosmic Dash web site is kind enough to have an extensive “New Reader Guide” page and archives to help you get caught up. 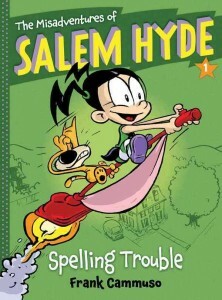 Salem Hyde is a black & white fantasy comic series written and illustrated by Frank Cammuso — which he’s published in 5 collections since 2013. 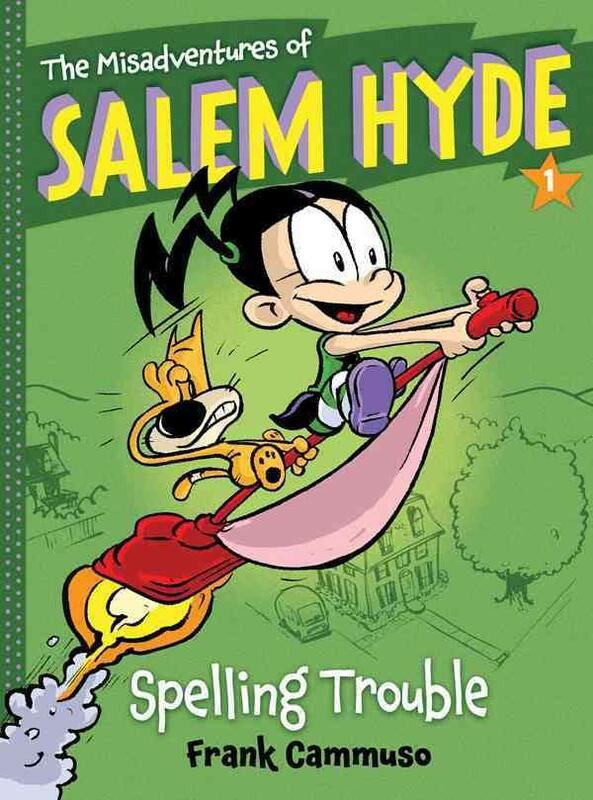 Here’s the description of the first volume, The Misadventures of Salem Hyde, Book One: Spelling Trouble: “Salem Hyde just isn’t like other kids. For one thing, she’s stubborn, independent, and impulsive. For another, she’s a witch. Salem acts first and thinks later—which means most of her thinking involves coming up with excuses! Good thing she’s been assigned an animal companion, Lord Percival J. Whamsford III. This over-anxious cat doesn’t like Salem calling him ‘Whammy,’ and Salem doesn’t like listening to his long-winded explanations as to why she shouldn’t do something . . . like enter the class spelling bee.” Of course he’ll try to explain to her they mean something different by “spelling”. Good luck! Check out the first book (available in hardcover and paperback) over at Barnes & Noble, then follow the links to find the rest. They’re published by Amulet Books. Few Internet phenomena have grown so huge as the droopy-faced feline known as Grumpy Cat. She is literally everywhere. 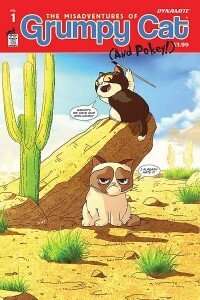 Well now, Dynamite Entertainment have brought us what is perhaps inevitable: Grumpy Cat has her own full-color comic book series. “Dynamite proudly presents The Misadventures of Grumpy Cat #1, featuring The World’s Grumpiest Cat and her brother, Pokey! With her ever-present pout and sassy disposition, Grumpy Cat has won the hearts of people everywhere. Grumpy Cat is the perfect combination of unbearable cuteness, instant fan appeal, and established multimedia presence. 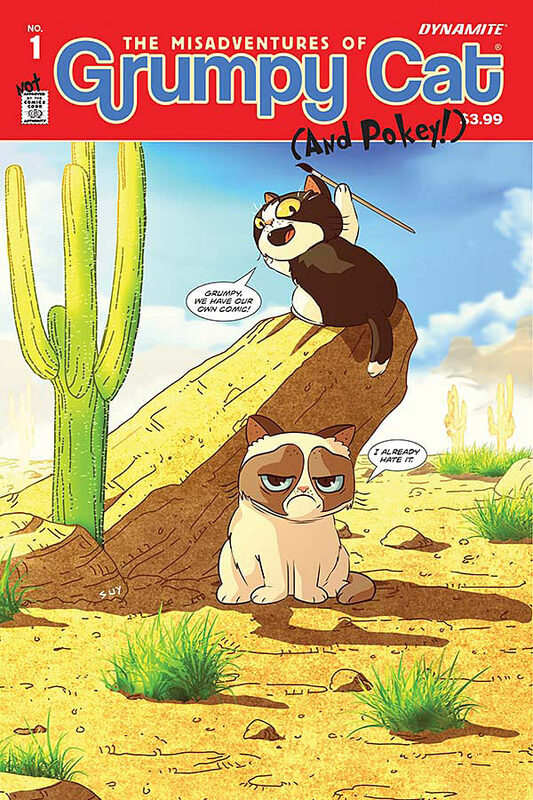 If you love the memes, the videos, and that irresistible scowl, then get ready for the wildly fun antics of Grumpy Cat and Pokey in Dynamite’s all-new, all-sensational Grumpy Cat comics!” With artwork by Steve Uy and Ken Haeser, and stories by a small army of writers, the first issue is available now. Check out the preview over at Comic Book Resources. Meow. image c. 2015 Dynamite Ent. 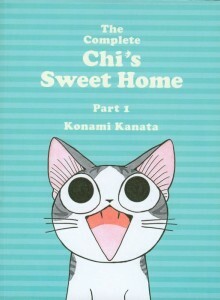 In case it slipped beneath your radar, Chi’s Sweet Home is a manga series created by Kanata Konami in 2004. “Chi is a mischievous newborn kitten who, while on a leisurely stroll with her family, finds herself lost. Overcome with loneliness she breaks into tears in a large park meadow, where she is rescued by a young boy named Yohei and his mother. The little kitty is then quickly and quietly whisked away into the warm and inviting Yamada apartment…where pets are strictly not permitted.” Vertical Comics licensed the manga for translation and distribution in the west. Now, they’ve released the first large-format collection in trade paperback. 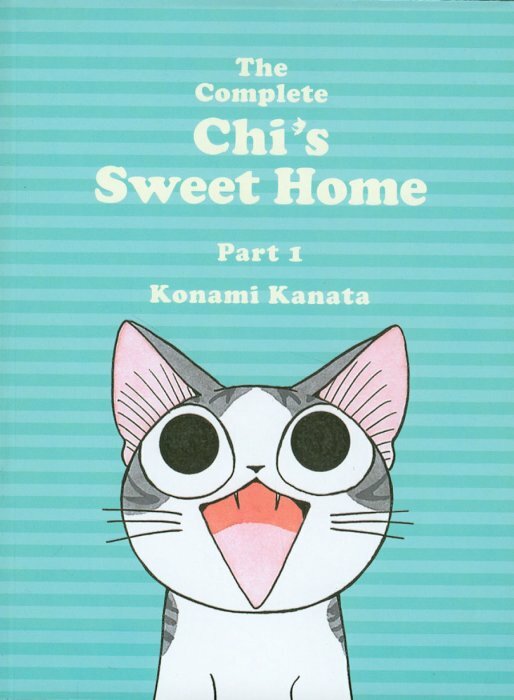 “Vertical’s most popular comic of all time, Chi’s Sweet Home, is now available in a larger format with brand new content! Hot on the heels of a new DVD release and the summer 2015 conclusion of its thirteen-year serialization, Chi’s Sweet Home gets a new deluxe release for new readers to dive into. The Complete Chi’s Sweet Home collects three volumes of this full-color all-ages adventure of Japan’s favorite kitten heroine – Chi! This new edition also features a brand new comic from Konami Kanata’s latest series in Japan – FukuFuku: Kitty Tales! This new release will feature new craft extras and a new story from the author.” Check it out over at Comic Book Realm.